This is the first App I’ve been involved with, even on the periphery, and we are pleased and proud to announce its launch. Do you like Champagne? I do! And I’ve already been to the Champagne region twice. Once to Rheims without this App, and once to Verzy with the people who created the App. You cannot imagine the difference between the two visits and I know which one I will be taking in the future. Cheers! Apart from anything else, the Champagne we drank on our second trip was so much more enjoyable, light, refreshing, organic and from a lesser known producer, a secret gem. The locals know all the best ones; stands to reason, doesn’t it? The beauty of the Champagne region is that it’s so close to the UK. You can leave home early and be there long before lunch if you are driving. And whether you go for one day or for a few, you’ll want to have this handy little guide on your iPhone or iPad. I feel a Spring break coming on…and this App enables me to have an entirely virtual experience of my trip in advance. What fun! 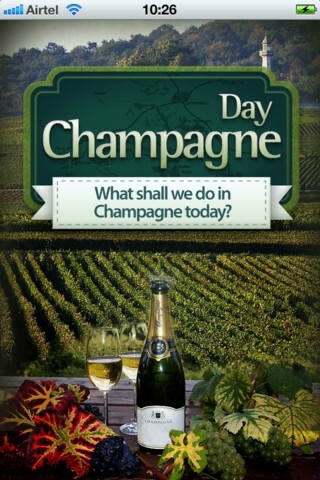 As Jiles Halling says, “Meet the special people and exciting places and start planning your trip to Champagne!” I can’t wait to visit again now and have a whole new world of Champagne open up to me with the handy little Champagne Day App.